There are all sorts of ways of tackling stress and sometimes it is a case of attempting to do several things at one time. Taking part in an unusual activity can help some people, however, as the act of moving away from the elements of your life that you find stressful can offer relief. At the same time, the fun, the concentration and sometimes the physical exertion of an unusual activity can offer just the distraction you need. People who are stressed are sometimes advised to find an empty beach and to stand and shout to their heart’s content. This is certainly not a bad idea (as long as you are far enough of away from others not to alarm them) but how about making a noise in other ways too? Trying taking up an instrument – drums could offer stress relief and learning to play a trumpet, saxophone or horn could also give you something to focus on while perhaps burning up some of your inner stress too. Singing in a community choir could also provide a release. Don’t worry about the standard of your vocals, lots of areas have “can’t sing choirs” which have been established for pure fun. Laughing can be a fabulous way of really unwinding – and it is something you can do on your own or with others. Nothing is as much fun as live comedy. Why not book a night out at your local comedy club once or twice a month – or save up to see a big name comedian next time he or she is in town? Failing that, how about having a comedy movie marathon? Rent four or five well-reviewed comedy films and settle down with a bowl of popcorn to laugh away some of those pent up feelings. Physical exercise is a great way to de-stress, but try to find something unusual to participate in. This is more likely to hold your interest and therefore keep you continuing to do it. Those around you might also be more supportive of what you are doing, helping you to allocate time to your new activity. Try boxing, kick boxing or dynamic yoga for something fast and furious that will give you a good work out too. Dry ski-slope skiing, hip hop dancing, scuba diving or trampolining could also be fun. Don’t worry about your age or experience, talk to the coach or tutor first as there may well be sessions that are ideal for people like you. Challenge yourself to do something out of the ordinary that will be enjoyable and exhilarating. The planning could end up being as much of a stress release as the activity itself. Those on a budget could map out circular routes that take them past pubs, galleries or other points of interest. Then every weekend they could spend half a day following the routes on foot or by bike. If it’s raining, book a public transport day pass, pack a picnic and head off to spend a day exploring away from your problems. 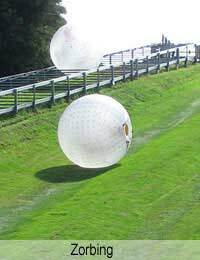 Those who can afford it, could try adrenaline pumping experiences like zorbing (where you roll down a hill in a see-through ball), paragliding or bungee jumping. Once again the distraction and stark difference to everything else you have going on in your life may help you to return to reality ready to tackle those stressful problems head on.